1. As a class, we will choose another class novel to read to start each day. We will do poetry concurrently. ​We will vote on the following novel/book choices: Lesley's Journal, Happiness Advantage, 5 People You Meet in Heaven. 2. We started the unit by looking at "The Top Five Reasons Students Hate Poetry." 3. For Each of these reasons, I will advance a counter-reason to explain why this unit is going to be great! REASON 1 - IT'S TOO HARD TO UNDERSTAND - THE LANGUAGE IS TOO COMPLICATED! -There's a movement called "Slam Poetry" which takes some very complex ideas and makes them accessible to everyone! -We will watch a slam poem to see. REASON 2 - It is too detailed. REASON 3: Poetry ask us to slow down. Things have to move quickly to keep our attention. However, Poetry asks us to do this to slow down and look at something in detail like this clip from Austin Powers: Show Austin Powers clip (http://www.youtube.com/watch?v=iLKR9tCiwvA) of him turning around a car in an 80 point turn. It asks us to look at something in detail and think about it rather than doing it quickly, which essentially goes against everything we want. REASON 4: No one uses it in real life. Not true! We will look at poetry in music, advertising, riddles, children’s books in order to show you that it is everywhere and something worth knowing in order to better appreciate the things we come in contact with in our everyday life. For Instance, here are two youtube videos which reveal how much poetry is used in the music most of us listen to. REASON 5: Students think that studying poetry means writing poetry! I will at times ask you to write lines to show me you understand, I will not make you write a poem completely on your own unless you want to. However, we may end up writing bad poetry on purpose! ​REASON 6: Why can't they just say what they mean! Poetry attempts to look at something in a different light so that we understand it even better or consider aspects we have never considered before. Talk about how the poets sees things like a child with fresh eyes. As a class, let's think of examples of how when they were children they saw something in a different light. For example, whenever my parents would point out the Hope Slide I looked everywhere for a waterslide. https://www.youtube.com/watch?v=a8tngtNgXl4 - 3d Street art + Time Lapse of them paining it. ​1. Today we are just going to have fun with the language of poetry and how it really can be anywhere. Directions for Magnetic Poetry - Students need to get into groups of 2-3 and come up with following and put them on the rectangular chunks of paper Mr. Fitton cut up. 9. Give students masking tape and have them display their poems on the classroom walls. 10. We will post the poems on the door. 11. Do a “symbolic analysis” of the poem. 12. Leave poems up around the room for a week or so to intrigue/confuse/amuse/enlighten/perplex/infuriate/annoy/challenge all who read them. Lesson 3 - Poetry Continued - Poetic Terms to Know. ​2. Look at A Martian Sends a Postcard Home and Riddle Poems. Talk about how poetry looks at things from a different perspectives. 3. We may not cover these in class - but here are some puzzle poems. Students can write their own too for the class. 3. 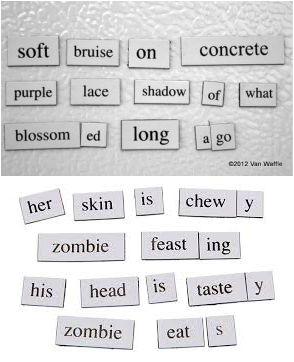 Hand out Poetry Sort (Matching/Definitions - see below.) Students need to match the term to the definition. Keep the sheet for study purposes. 5. Tell them to print off a school appropriate song when done. Identify as many devices as they can. 6. Review poetic terms by getting them into pairs and sculpting poetic terms in playdough. Give the example of Stanza. Present to the class. 1. Poets use imagery to get the reader to really identify with their subject matter, make them see, hear, taste, feel and smell whatever they are talking about. Define: Words/phrases that appeal to the sense and paint a picture in the readers mind. One of Mr. Fitton's favourite poems is all about Imagery and why it is important. 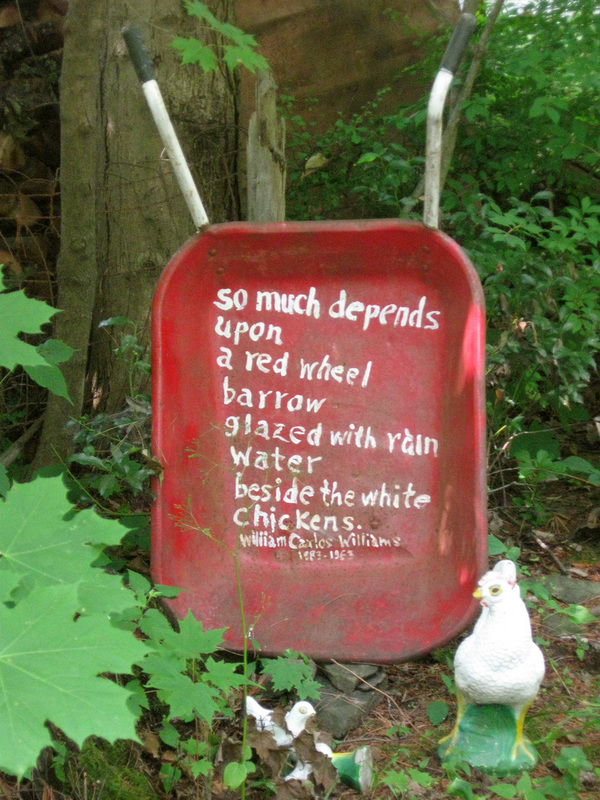 William Carlos Williams wrote the poem "Red Wheelbarrow." See below! 2. Hand out imagery sheet, but explain that we are going to do a more interactive study of imagery, but that they can fill out their answers on the sheet. Explain that each answer must be a minimum of a sentence and have VIVID details, we will vote on the strongest images for a prize. Hand out a candy item. Get them to create a 5 sense poem for their object (_____________ Feels like, looks like, smells like, tastes like, sounds like. Get them to write it on 11x17 to put on display. Share their poems and give a compliment to each one. 1. Explain what the word Symbolism means: "A concrete object that represents an abstract idea." Don't worry - Mr. Fitton will explain. 4. Show them the music video to “Another Brick in the Wall.” Ask them to pick out the symbols. ​5. Ask them what the connotations of the word red? How about Balloons? Write on the board, what do you think that a balloon would symbolize? 6. Ask them what they know about the Cold War and the threat of nuclear war, discuss, explain threats associated with a nuclear explosion (Show overhead and discuss). Culture reflected this, if everyone may die at any moment, social beliefs change - some believe that people may as well do drugs and free love. 8. as they are listening, try to summarize the story of each STANZA into one sentence using the handout provided. What are the dominant themes? What does the Balloon now symbolize? 12. Does this poem have universal themes? Do feelings like this still exist today in the post-cold war era? 4. Identify a theme of one of the 2. Have them write a theme statement and 2-3 lines that support it. Explain how the quotes back it up. ​Our focus here is on how language can be extremely fun. ​4. Play clip from Blood Diamond and discuss conditions in developing countries. Which helps us understand a bit about the metaphor of the "Waving Flag" in our next song. 5 Play Wavin’ Flag and get them to answer questions. See youtube clip above. ​7. Worst Metaphor contest. Make one and share with class. 3. Pick out Irony in a parody of "Ironic" by Alannis Morissette. 1. Teach the terms Metaphor and Simile. Have students look at their initial unit handout. Explain why we use metaphors as humans. Sometimes we need them to help us explain the world, love, life, etc. 2. Show the worst metaphor contest; create own worst metaphors / similes. Students have to create their own extended Metaphors. Read out the extended metaphor from "The Five People You Meet in Heaven." 1. Intro to our movie study of Forest Gump. 3. Free write: "A time you did something for a friend that was important" or "a time a friend did something that meant a lot for you."